We have 2.5%, 5% or 10% shares available in our new acquisition, the bay 2 year old filly by the sire HEERAAT out of our 7 time winning ex-race mare AVAILABLE. She is a lovely, good moving filly and will be trained to be an early two year old for the 2019 turf season. Her dam was a very consistant sprinter, winning 7 times and placing 28 times, hardly running a bad race. The sire was a high class sprinter by Dark Angel and our yearling is bred to be quick! The upfront cost for a 5% share is £400 and £95 a month to cover all training and racing expenses. A 10% share will cost £800 upfront and discounted monthlies of £170. Limited numbers of 2.5% shares are also available priced at £200 upfront and £50 per month. Please enquire for further details via our "CONTACT US" page. 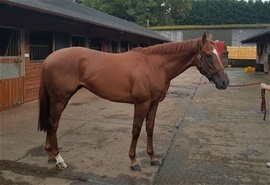 We have shares of 2.5%, 5% and 10%+ available in our new acquisition, the talented 4 year old chestnut gelding KINGS ACADEMY. A winner over 5f at Leicester in August 2017, this robustly built sort has shown a good level of ability at a variety of trips up to 7f and should stay a mile and possibly 1m2f as a 4 year old+. By the top class sprinter Mayson and from the high class dam family of Inchinor, Kings Academy ticks all the right boxes we look for in a purchasing a young horse for our syndicate and we are very excited to have acquired him. The upfront cost for a 5% share is £500 and £95 a month to cover all training and racing expenses. A 10% share will cost £1000 upfront and discounted monthlies of £170. Limited numbers of 2.5% shares are also available priced at £250 upfront and £50 per month. 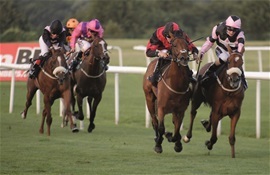 We have 2.5%, 5% or 10% shares available in our homebred 6 year old 2 time winning mare INFLEXIBALL. She won a 1m2fs handicaps at Doncaster and Leicester in the summer of 2017 and should win more races on the flat off her current mark. She has also been schooled over hurdles at home and jumps very well, giving us the option to mix flat racing with hurdling during 2018.